How do you select a good dog bowl? 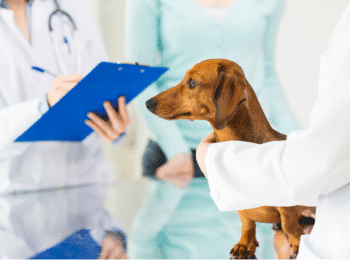 There are many important factors to consider when choosing the right dog food bowl for your dog (especially your dachshund). Is the bowl dishwasher safe, BPA Free, and what material is it made out of? Is it durable (can they chew on it)? Most importantly, will it slow down my dachshund so he doesn’t engorge himself. After researching 20+ dog food bowls, I decided to buy this Slow Feeder Dog Bowl for my Dachshund, it is the perfect bowl for his overeating issues. The price is great considering this bowl does an awesome job at slowing down my dog when he eats his meals. After several trips through the dishwasher, this is truly a strong and durable dog food bowl. Dachshunds LOVE to EAT a lot! They will graze all day long if you gave them the chance. 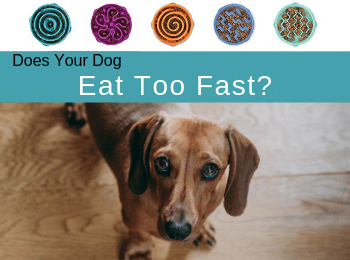 It isn’t healthy to allow them to eat all day long, so it is recommended to only put down the dog food about 20-30 minutes each time they have a meal. I recommend using Slow Feeder Dog Bowls to help dachshunds with their digestion. Avoid purchasing cheap dog food bowls. 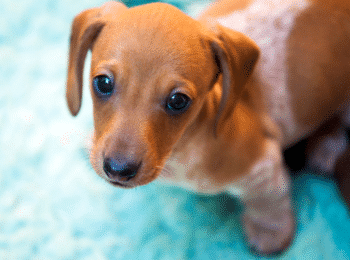 They can be made up of dangerous chemicals that can leach into the dog’s food. Glazed Dog Food Bowls like quality ceramic, glass, or stainless steel bowls are recommended. These types of bowls are non-porous, chew resistant, and can be easily cleaned in the dishwasher. If the dog food bowl is plastic based, stick with bowls that are BPA, PVC, & Phthalate Free. It is helpful to purchase a dog food bowl that is slip-resistant to prevent the bowl from sliding or tipping and causing food spillage. 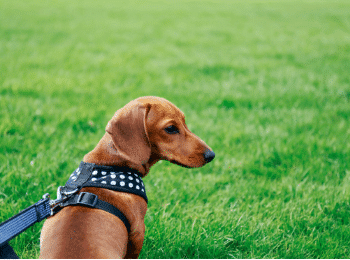 Dachshund Tip: If you have a dachshund dog that is prone to having seizures, avoid using Aluminum Dog Food Bowls. Heavier Weighted dog food bowls work well for dogs who love to tip over their food. Dachshunds love to scoot their bowls across the floor and at times like to flip the bowls over. Sometimes it is as if they are trying to bury or cover their food, or they may just be acting like silly Dachshunds. It is so much more convenient to have a dog food bowl that can be placed in the dishwasher. I recommend getting a couple of high-quality dog food bowls at a time. One can be washed while the other is in use. It is recommended to wash out your dog’s food and water bowls 1-2 times per week. Why a slow feeder dog food bowl? If you have a dachshund dog that stuffs their mouth full of food and eats so much that he chokes or has to lay down afterwards, slow feeder bowls are a great option to try. They are recommended by veterinarians to help improve digestion naturally by slowing down meals. Giving your dachshund a slight challenge when eating his food is also a good mental exercise. Outward Slow Feed Interactive Dog Bowl : This slow feeder bowl gets my vote for number 1 choice, this is the Best! It slows the dog down while they eat and promotes fun healthy eating habits. 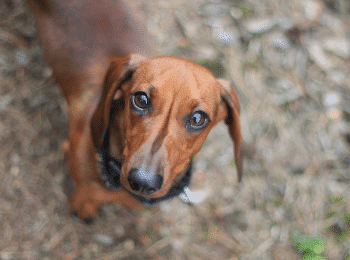 This helps aid in healthier digestion for your dachshund. It has a non-slip base and it is not made of any of these hazardous materials: BPA, PVC, & Phthalate. This bowl comes in a large or small size and various colors to choose from. Here is the slow feeder dog bowl Product video . Decyam Pet Fun Feeder Dog Bowl Slow Feeder: This Bowl is pretty awesome. It is BPA Free, dishwasher safe, and has a Non-Slip base. It helps promote healthy eating by slowing your dog down from eating too fast. Neater Slow Feed Bowl Stainless Steel : The Neater Slow Feed Bowl is made of Stainless Steel. It helps reduce dog food gulping, bloat, and rapid eating habits. It is also dishwasher safe. This bowl doesn’t have a nonslip base to it. So, I suggest getting a non-slip mat or tray to go with it. Reopet Silicone Dog Cat Bowl Mat Non-Stick Food waterproof Pad for food and water bowls. Hyper Pet Lickimat Slow Feeder Dog Mat for Food and Treats : This product is more for wet dog food. This is an alternative to the slow feeder bowls. Its unique pattern helps promote healthy teeth and gums and promotes fresh breath. Neater Feeder Deluxe Dog The Mess Proof Elevated Bowls: If your dog loves to eat in a super messy way, this bowl is for you! My dachshund loves to push his food out of his bowl. Not sure why he does, but this bowl has been a big help with his interesting habit. Neater Feeder Deluxe Elevated Dog Bowls are mess proof and non-slip. It comes with two Non-Tip Double Diner Stainless Steel Food Dish and the Stand.Neater Feeder is the world’s first pet feeding system for dogs and cats that contains spills and splashes and separates spilled food from spilled water. Spilled water drains into the lower reservoir while spilled food stays off the floor, so it can be safety reused or easily discarded! Created for dogs weighing up to 18 pounds, with a shoulder height of 6-9” and includes one 1.5 cup stainless steel food bowl and one 2.2 cup extra capacity stainless steel water bowl. Also included are a set of 4 non-skid insert pads. COMSUN Collapsible Travel Dog Bowl : This smaller travel bowl is perfect for the pet owner on the go. It is Portable, Convenient, Non-Slip, and Collapsible! It is made with flexible Food-Grade silicone, 100% lead-free, BPA­-free. WINSEE Collapsible double Dog Bowls. Alternatively, Check out this cool travel double dog food bowl. This Bowl is BPA Free, Dishwasher safe, and Non-Skid base. Ancaixin Pet Food Solution: Made up of non-toxic plastic material and non-slip base. This bowl makes meal or treat time a fun challenge for your dachshund dog. Interactive Dog Puppy IQ Treat Ball Slow Feeder Bowl Nontoxic Dog Food Dispenser: This is an IQ puzzle for dog food or treats. They have to figure out the puzzles to get to their food or treat. A great way to keep your dog entertained and eliminate boredom. This is made of food-safe materials, is non-toxic, and durable. Seafirst Dog Food Dispenser Puzzle Toy Puppy Treat Food Dispensing Bowl Dog Training Puppy Puzzle Game: This treat dispenser puzzle game is made with non-toxic, durable materials and chew resistant. This dog puzzle will attract your dog’s attention and encourage healthy play time. Petfactors Pet Food Scoops: These dog food scoopers will help you measure out the correct amount of food for your dog. They are made of food-grade level material and are dishwasher safe. They can be used on dry or wet dog food. What Dog Food Bowls do you recommend? Leave a Comment for me below. 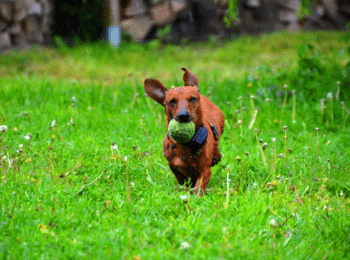 Now that you have chosen the perfect dog food bowl for your dog, check out my article on the Best Feeding Schedule for your Dachshund.